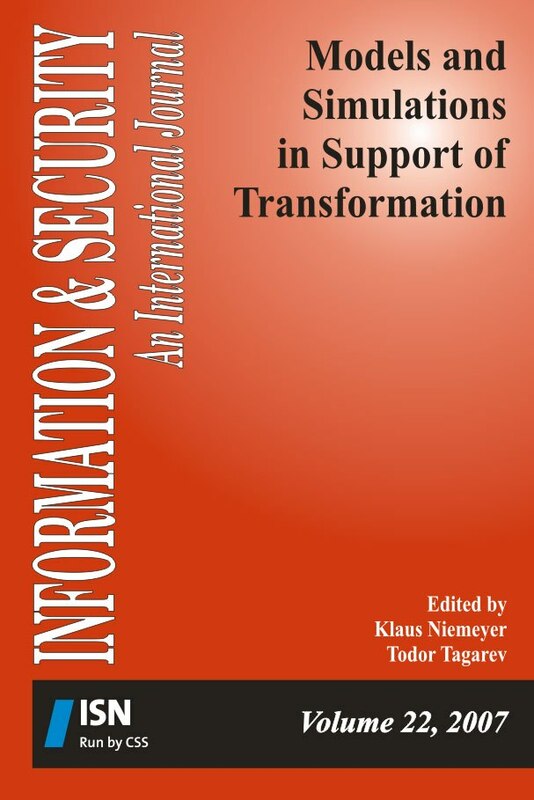 This volume examines advanced theoretical approaches and concepts to the use of models and simulations in support of transformation of security and defence organizations, as well as examples of practical solutions. Among the specific themes are the modelling of social systems, knowledge-based transformation and decision support, battlespace awareness, simulation-based wargaming, critical infrastructure protection, and multinational and interagency operations. Editorial. "Supporting Transformation." Information & Security: An International Journal 22 (2007): 5-6. Shemayev, Volodymyr. "Cognitive Approach to Modeling Reflexive Control in Socio-Economic Systems." Information & Security: An International Journal 22 (2007): 28-37. LEHMANN, Tobias, and Andreas Karcher. "Ontologies and Semantic Web Technologies to Support Knowledge-Based Transformation and Decision Support." Information & Security: An International Journal 22 (2007): 49-63. Hofmann, Marko A., and Tobias LEHMANN. "On Simulation-based Wargaming: Comparison of Two Different Methodological Approaches." Information & Security: An International Journal 22 (2007): 64-72. Kharchenko, Vyacheslav, Vladimir Sklyar, and Oleg Odaruschenko. "Dependable Computing Systems in Support of Transformation of the Force Information Infrastructure." Information & Security: An International Journal 22 (2007): 75-91. Tornev, Gueorgui. "Modeling Support to Battlespace Awareness." Information & Security: An International Journal 22 (2007): 92-101. Mednikarov, Boyan, and Kalin Kalinov. "An Alternative of the System Approach to Functional Aspects Analysis of the Maritime Crisis Management System." Information & Security: An International Journal 22 (2007): 102-122. Shalamanov, Velizar. "Computer Aided Dispatch – A Tool for Effect-Based Multinational and Interagency Operations." Information & Security: An International Journal 22 (2007): 123-137. Mednikarov, Boyan, Nedko Dimitrov, and Kalin Kalinov. "Applying the System Approach to the Study of Critical Infrastructure." Information & Security: An International Journal 22 (2007): 138-150.